Having problems with your swimming pool system? How about your spa, hot tub, jetted bath tub or whirlpool? Well, you have found Houston's experts, and we do it right the first time! No matter what your issue, Barry's always begins with a thorough diagnostic and troubleshooting of your entire system. Identifying the exact trouble-causing issues we have both the knowledge and the technical expertise to fix, repair and adjust each and every component correctly - as well as the crew and resources. From pool heaters repair, pumps, filters, valves, auto and remote controls, control station programming to natural water chemistry and more. You name it we can do it. 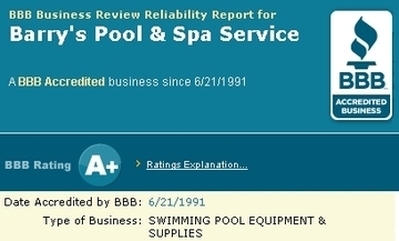 Established in 1988, our company boasts over 25 years of experience in the swimming pool and hot tub systems equipment industry, servicing the greater Houston, TX area. We have the continued training and certification (and often professional recommendation!) of every major swimming pool and spa equipment manufacturer and our expertise in water chemistry is second to none. To learn more, check our professional qualifications, read customer reviews for our services and more. I needed BIG help with my pool and I lucked out when I found Barry\'s Pool Service. From the moment I spoke with Barry on the phone until the moment David turned the pump on I could not have been more confident in their service. They took the time to explain every detail, answer every question and make me feel comfortable. As bad of a situation that I had, I just knew I was going to get the runaround and overcharged. NOT WITH THESE GUYS! They take extreme pride in their knowledge, work and reputation. I will recommend them to everyone I know for the rest of my life. Owning a pool is so much better having quality people like them on your side. Thank you guys for all your help and hard work!